Whether it is a workshop owner or a contractor, having good quality, lightweight tools within an affordable budget is indispensable. For those who tend to handle more of wood items during their work, it is essential to have a professional cabinet table saw that is available at a competitive rate. 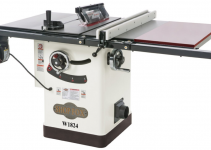 A table saw is usually at the core of any joinery operation in a workshop. When it comes to having a hybrid type of table saw, it has to be more accurate and stable, safer, and more flexible to easier adjustments. If you are looking for such a saw, the G0715P Polar Bear Series with Riving Knife can be your best choice. It is a budget but state-of-art table saw to pack robust performance and common safety features within its aesthetically pleasing body available at a fraction of what a typical table saw costs. Designed to perform consistently day after day, this saw makes your regular wood cutting a breeze, regardless of the kind of wood you use. The most distinct aspect of this tool is its hybrid design that delivers full features of cabinet style along with the convenience of contractor style table saws. Although its weight is lighter, the tool encompasses a high-end contractor style with the size same as any contractor saw. Both the styles are packed in one design costing below $1,000. This 2-in-1 table saw comes with several features to work with, which makes way for you to customize the tool effortlessly for different tasks or projects. Each feature has its own strengths to ensure you easy and smooth woodworking. Let’s explore them out now! This hybrid table saw belongs to newly introduced polar bear series, which is evident from the main base’s embracing polar white color. The 10-inch design is likely to retain a bright and pleasant workshop. While the white powder coat of paint adorns the cabinet, the table is composed of precision-ground cast iron. Even the trunnions are of cast iron. The wings and top in cast-iron are quite flat. The moving components such as blade adjustment wheel and fence are amazingly smooth. Talking about the throat plate, it has fine stiffness but is not as thick as plates on a few other saws among our table saw reviews. However, you will be getting insert blanks for this hybrid model, which is commendable. Coming to the fit and finish, it is all fine. Although the tool weighs 416 pounds, it is capable of minimizing vibrations. However, the extent of minimization is dependent on how and where you mount the tool. Well, it is recommended to place the tool on a genuinely flat surface or on a custom mount. If you do not mind the heavy weight, the table’s construction is truly commendable. The overall size of this hybrid saw is 60 x 36 inches with a table height of 34 inches. Coming to the rip capacity, it is highly decent – typical 12 inches on the left hand side and 30 inches on the right side. This capacity is more than sufficient for large planks with whom you may have to deal on regular basis. Well, this is a hybrid model. So, you should not expect the motor to beat an upscale expensive cabinet style model. Still, you will be happy to know that the 2-HP motor has enough muscle to rip any kind of wood or make any cut that is commonly done on daily basis in a workshop. You can unhesitatingly go for a rip cut in hard maple. The 16-amp power is enough to rotate the blade at a striking 3,850 RPM. Considering the price at which this hybrid table saw is available, this power is perhaps more than you expected, than a few upscale models offering the same RPM. The model features a wire for working with 220 volts. However, you can easily rewire for working with 110 volts. Apart from an inexpensive motor, the tool also features a winding belt and pulley system. This system transfers power efficiently as well as more easily apart from making the system run quietly. This system also facilitates more torque and less slippage for making its way through even the densest item. Well, the blade is carbide-tipped saw blade measuring 10″ x 40T. Along with the standard blade inserts, there are dado table inserts for making some more creative cuts. While cutting at 90 degrees, the capacity is at 3-1/8-inches. If you move the blade to 45 degrees, a cut depth of 2-3/16 inches is what you can achieve. The tool comes with an easy-glide fence arrangement that is responsible for easily moving the T square. It also features a popular Grizzly feature, the Camlock that is designed into the T-shaped fence. The T-shaped fence is admired by all customers, as it contributes to superb accuracy of this tool while measuring up. This is something that a budget, and that too, a hybrid model does not offer. You can expect all cuts to occur with utmost precision, which is something that any level of user shall enjoy. For adjusting the T-square style fence, knurled knobs are included in the tool. The fence itself is solid, hefty, and is protected down square without deflection. Many joiners and hobbyists simply rejoice using this fence, as it is easy to use, well engineered, and is quite intuitive. The Cam-lock style fence features patented design that is admired for its reliability, convenience, and precision accuracy. The interchangeable riving knife looks after protecting the actions that involve discarding the blade guard for gaining more intricate cuts. Such actions are usually the ‘non-through’ cutting tasks. The outcome is astonishing with this handy riving knife. Just like other Grizzly table saws, this one also comes with a quick-change blade guard. However, it comes with anti-kickback pawls that you can place away from the work piece. With the riving knife, the quick change blade guard allows swapping the blades easily in and out. The knife’s release mechanism is most convenient, as there is no need to discard the throat plate for moving between the guard and knife. You only need to glide a thumb-wheel back and sideway to release the knife. Then, just glide in the guard and move the thumb-wheel to sideways and forward for locking the knife. Isn’t that easy? Design wise, the blade guard has a leaf on each side, both of which pivot up when you feed wood under them followed by an autonomous rise. As a result, you can lift just one leaf for having a thin rip. The arbor lock is also easy to access and reliable for conveniently having single-wrench blade changes. Apart from the changeable riving knife, the tool ensures you of easier and quicker but safer cuts. At 83 decibels, you can expect a relatively quiet operation, which is definitely a welcoming feature if you are replacing an older saw. There is also a jumbo paddle off switch in power switch, which is a handy safety measure. Additionally, a locking mechanism is responsible for keeping the fence in place. The 4-inch dust port is also included to gather a big amount of dust, which is an admirable benefit the Polar Bear Series offer. This saw dust collection is touted to be the same as in an upscale unit. This output vacuum port is sturdy and flexible enough to fit with a variety of universal vacuum sockets. In absence of blade shroud, the system of dust collection is still good. Moreover, over the motor, a full-size hinged door contributes to easy vacuuming of dust on the cabinet’s bottom. This tool is CSA– and UL-certified. It is always better to have a cabinet table saw with more power. The powerful Single Phase 2 HP motor does its job smoothly and efficiently without compromising accuracy. This is regardless of the number of times you use the unit. It is also commendable to have an arbor speed of 4,300 RPM coupled with mandatory dado support, a mix that is important for many woodworkers. The height of table is sufficient enough to take up any project. The solid base structure allows you to work with a variety of wood without any hassle or issue. You can even get several accessories for customizing this tool. The tool also supports a mobile base for running a small shop. * The model is priced more economically than a cabinet style model although there is a large table with cast iron wings. * The heavy weight ensures stability while motor ensures proper power to cut even hard maple smoothly. * Although powerful and heavy, the model is also portable enough to be taken to any place with the fence and wings off. * The model ensures utmost accuracy through its famous Camlock T-shaped fence. * The model comes with ample of safety features. * The performance is also reliable and as per what a professional would expect. * The model also ensures solid table cuts. * It takes both time and effort to assemble involving aligning of table wings and removing all grease, despite there is legible manual. * The T-slot miter gauge seems to be a bit weak, in terms of its fitting in the slot. This is because there is much slop between the slot and its accommodating bar. * The throat plate is thin due to which it becomes a bit complicated to make a zero-clearance insert. * The power cord is short. * The top surface of the model is prone to rusting. According to most customer reviews, this hybrid model from Grizzly is ideal for hobbyists. This is perhaps because of the rusting and maintenance issues easily putting off the professionals. However, the model is also not for more casual users due to the quantity of effort required for setting it up. Moreover, the unit is big and tough. Thus, the ideal candidate for this model is someone who is between the hobbyists and professionals. It can be an ideal workshop tool for those who love the fence reliability, high quality of cuts, and cast iron construction. The Grizzly G0715P hybrid table saw from Polar Bear Series is a commonly purchased saw due to its high quality design and outcome. Grizzly, as a brand, is known for its high end quality when it comes to buying a table saw. In fact, it is one of the leading brands for table saws. The aforementioned cons do not overcome the pros due to which you can rely on this unit for almost any wood-based task. You can expect this solid model to assist you for any type of project. Although it is a bit tough to put it together, the upcoming experience of comfort and convenience shall tell you why experts regard this unit. For such versatility that you can enjoy daily, the credit simply goes to the cast iron construction, impressive belt drive, trunnions, and the large dust port. This is regardless of whether the project is big or small. You will never be disappointed with this model even though the blades are thinnest kerf ones while proving themselves sufficient for most jobs.